Choose bridesmaid bouquets with unique appeal for a little wedding flair. Ideas for some unique designs for bridesmaid bouquets include exotic blooms, faux bouquets, and unexpected color combinations. Explore several of these ideas before deciding on a design. Just because they are your maids does not mean they should fade into the background. Instead, bring them to the forefront of the wedding party by providing them with interesting twists on the usual wedding flower bouquets. Use unique holders for the flowers. Rather than the usual hand-tied stems, have the bouquets placed in baskets, pails, or even purses to be carried down the aisle. Sports themed weddings could even use koozies as the stem wrap, while a motorcycle themed wedding could incorporate long leather ties around the stems. Having the bridesmaids carry arm bouquets gives another unique take on the typical round bouquet. In the spirit of individuality, you could also have each bouquet be a different shape. Similar to the idea of choosing mix and match bridesmaid dresses, each bouquet would feature the same flowers, but in a different arrangement. Nosegays, ovals, crescents, arm bouquets, round, or heart shaped bouquets could all be used in the same wedding party. Alternatively, use similar colors and shapes but different flowers for each bouquet. No longer are you restricted to choosing between silk flowers and fresh flowers for your wedding bouquets. Choose bouquets made from feathers, beads, paper, porcelain, and even wood. These bouquets can double as stunning bridesmaid gifts when you add a glass vase, as they will never die, fade, or need preservation. Be prepared to pay extra, however, as these ever-lasting bouquets can get expensive. Whether your entire bridesmaid bouquet is made of feathers, or you simply slip a few into a traditional bouquet for added eye appeal is up to how daring you want to be. Peacock feathers are a top choice for a more exotic look, while white feathers can look great at a Christmas wedding. Your regular florist may be able to create a feather bouquet for you; if not, plenty of places online can ship directly to you. Check out Ivyndell for fan bouquets with peacock and ostrich feathers. Show off your crafty side with beaded bridesmaid bouquets. You can pick up stems that have beads at the top, like this pearl beaded bouquet, for a simple elegant look. Entire bouquets, including flowers and greenery, can be made from colored beads, like those offered by many shops on Etsy. Making paper bouquets can save money and be a great alternative for a crafty bride. Full instructions are available from Martha Stewart, along with a PDF template. If you are origami-challenged, you can always purchase your stems from sellers like Paper Blooms. Give your bridesmaids a bouquet they will treasure forever. Porcelain bouquets in a small round size or tussie mussie would be perfect gifts for the women who mean the most. See the various collections at Porcelain Wedding Bouquets. NovelExpression on Etsy offers a unique bridesmaid bouquet alternative. Available in colors customized to match your bridesmaids' dresses and made of wood shavings and paper, you can configure any of the bouquets to match your wedding. Smaller bouquets start at just under $35, making this an affordable option. 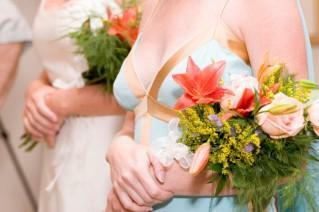 If you have a special bridesmaid bouquet idea, speak with your wedding florist. Even if you are not sure what look you want for unique bouquets, finding a florist who can take your ideas and turn them into a reality is key to getting what you want. Before you choose your florist, ask to see examples of what they would consider their most creative work. You can then decide if his/her style will fit into your wedding bouquet vision. Before they became your bridesmaids, the ladies standing at the altar next to you were family and friends. Show them how special they are to you by creating unique bridesmaid bouquets for them to carry down the aisle.